Social Responsibility: Charities We Support! What Are Blogs, Podcasts and Wikis? Assignment 2 – This is Not A…. My name is Mr. Borges. 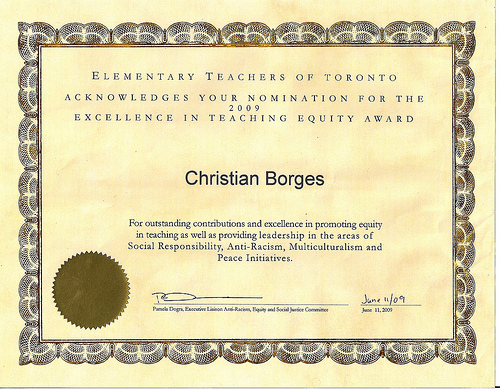 I’m a teacher at an elementary school in Toronto who teaches the Jr/Int Home School Program. If you’re not familiar with Home School Programs (a fancy name for Special Education Class), this is how it works…well, at our school anyway. Home School (HS) students are integrated for all subjects with the exception of English and Math. For these two subjects, students work with Mrs. Murry and me through individualised programs based on each student’s specific needs and strengths. Aside from the Math and English stuff, HS students have the opportunity to work in our room and use really cool computer, computer software and an awesome Smart Board that allow them to do and create amazing things. I few years ago my students and I worked with Ability Online assisting with the creation of their “Ask Anything Homework Guide”. The students were also asked to write Blogs, and eventually became known as the “Blog Squad.” They wrote about what it’s like being students and kids growing up in this sometimes crazy, but always cool world we live in. They discussed things that happen to them both at school and in their outside-school lives and addressed issues we were looking at in class. Students were free to write about whatever they wanted, so long as it related to their lives or interests somehow. After asking (forcing?) the kids to Blog for a little while, I figured it was only fair that I do it, and so I too kept a Blog for Ability Online, albeit not too regularly. We enjoyed the process so much, we decided to continue writing Blogs on our own and even introduced Podcasting to our class projects. And so, this page was born. Now we have this neat website to post our Blogs and our Podcasts. We have lots to say and hope you enjoy.